Mr. Williamson’s practice is devoted to complex civil disputes in both state and federal courts, including mass torts, catastrophic personal injury, and medical malpractice. He has served as a member of the Plaintiffs’ Steering Committee in the Benicar (Olmesartan) Products Liability Litigation MDL 2606 which reached a $358 million settlement in August of 2017 to resolve nearly 12,000 injury claims. 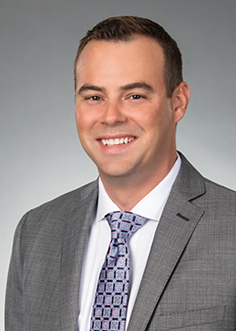 More recently, Mr. Williamson served as a member of the Plaintiffs’ Steering Committee and member of the Joint Discovery and Electronically Stored Information Committees in the Abilify (Aripiprazole) Products Liability Litigation MDL 2734 which reached a confidential settlement on February 15, 2019 to resolve approximately 3,000 lawsuits. In addition, Mr. Williamson has represented plaintiffs in the RoundUp MDL 2741, Bair Hugger MDL 2666, Cook IVC Filter MDL 2570, Bard IVC Filter MDL 2641, Biomet M2A Magnum MDL 2391, Wright Conserve MDL 2329, Deepwater Horizon oil spill MDL 2179, Levaquin MDL 1943, pelvic repair system litigation, including Ethicon MDL 2327, Coloplast MDL 2387, Bard MDL 2187, and Boston Scientific MDL 2326. He has also represented plaintiffs injured by the da Vinci robotic surgical system as well as the hormone replacement therapy drug Prempro. Mr. Williamson began working with the Firm in 2010 and became a partner in 2017. He received his Juris Doctorate from the University of Miami School of Law and is licensed to practice in all Florida state and federal courts, and has been granted pro hac vice admissions in numerous federal courts around the country. MDL 2385 - IN RE: Pradaxa (Dabigatran Etexilate) Products Liability Litigation. Representation of an estate in multidistrict litigation against manufacturer of blood thinning drug Pradaxa. MDL 2326 - IN RE: Boston Scientific Corp. Pelvic Repair System Products Liability Litigation. Representation of woman severely injured by a transvaginal mesh device. MDL 2187 - IN RE: C.R. Bard, Inc., Pelvic Repair System Products Liability Litigation. Representation of woman severely injured by a transvaginal mesh device. MDL 2179 - IN RE: Oil Spill by the Oil Rig "Deepwater Horizon" in the Gulf of Mexico, on April 20, 2010. Representation of hundreds of clients in claims arising out of the BP Deepwater Horizon Oil Spill. Recovered settlements for clients in excess of $7.2 million. MDL 1943 - IN RE: Levaquin Products Liability. Represented numerous clients in multidistrict litigation against manufacturers of the antibiotic drug Levaquin. Representation of client in federal court against medical device manufacturer Smith & Nephew for severe injuries associated with a metal -on-metal hip implant. Representation of woman severely injured after taking hormone replacement therapy drugs. Representation of major lenders in mortgage-related litigation in state court proceedings. Representation of banking institutions and mortgage servicers in defense of Truth in Lending and other consumer litigation. Representation of international hedge funds in federal court proceedings in defense of SEC Ponzi scheme related cases. Represented transportation service provider in appeal of temporary injunction to Second District Court of Appeal.